Juki Corporation, founded in 1938, is a Japan-based world-leading comprehensive manufacturer in the field of industrial sewing machines having the users in about 170 countries and regions. 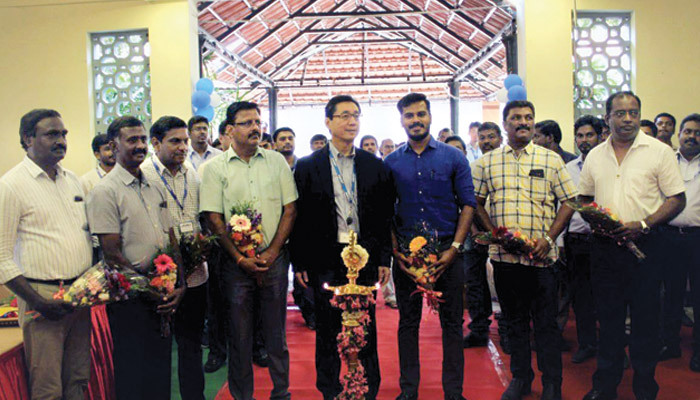 The industrial sewing machinery major recently organised a two-day event at Velan Fair Ground, Tirupur on September 6-7, 2018 with a view to showcase the latest industrial sewing machines and to unveil the cutting edge technology for sewing operations. The event witnessed many new product launches and JaNet Live Show. Juki’s new JaNet system enables quick problem solving, skill up support, reduction of set-up work, quick response for maintenance, visualization of factory. At this occasion, the company also conducted a seminar about Achieving Buyer’s Date. The Chief guests for the event were Manikandan, MD – SRV Knit Exports, Sadhasivam, Partner – Honey Well Creation, Elngo, MD – Ahill Apparel, Senniyappan, MD – NSP Knitting Mills, Visvanathan, MD- Prossper Exports, and Bisvall, IE – Leeshark Exports. 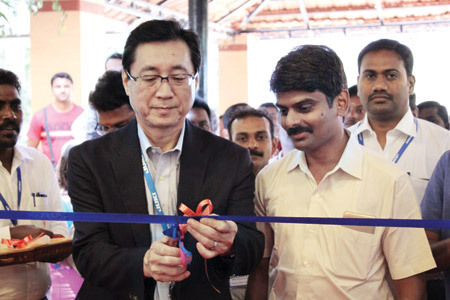 Besides, representatives and heads of all its agent companies including Somasundaram from Vibgyor Trading Co., Suresh from Sree Chakra Sewing System, Shanmuganathan from Innovative, Dharmalingam from Malayamman Sales Corporation, Ganesh from Allwin, Ponnvel and Senthil from Rainbow Garment Machines, and Kalidas from IIGM also graced the occasion with their presence. The Juki Corporation has been conducting various exhibitions and events around the world. 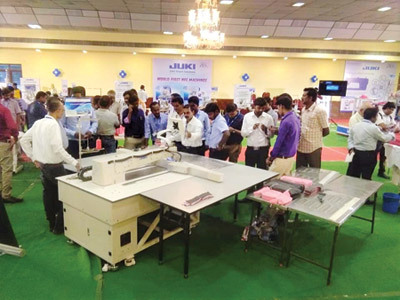 At Tirupur event, the company highlighted its various technologies including JaNet (Juki Advanced Networking System), Auto Bottom Hem, Auto Sleeve Hem, Auto Polo Placket Making Machine and new devices for improved production. 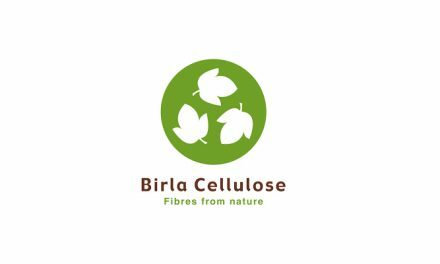 According to the company, the two-day event attracted more than 1,050 visitors including 547 customers from Tirupur, Erode, Karur and Madurai, and got good business for the company. Juki’s JaNeT software control system which enables greater workflow efficiency became the major attraction at the event.The new JaNeT system from Juki is, in essence, an artificial intelligence operative. The computational software has been developed to interlink Juki’s digital technologies – each of which are currently confined to an individual production process. 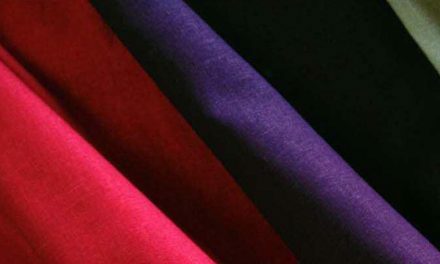 The thinking behind this is that, instead of employing 20+ machines to produce a garment in its entirety, the company can now condense this workflow into fewer (around 7 to 10) highly connected and more versatile machines that complete production both more efficiently and cost effectively. The company’s newly lunched auto sleeve hem and auto bottom hem aims at improved production, reducing manpower and machines. 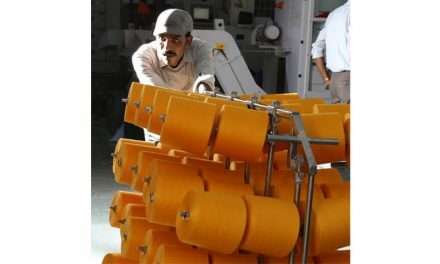 Its MF-7523 D –U11 – B56/GMD2S+PB+EC+SAF/ DD – Hemming correction feature by means of roller system at the start of seam, 5000 rpm can able to run, Capacity – 3,200 – 3,500 sets /8 hrs, Additional Attachment in Flatbed Coverstitch machine helps to reduce experienced operator for Hem Sleeve. PS -700 – Pattern Seamer (X: 1200mm x Y :700mm) – Large Sewing Area- has achieved the industry’s highest jump speed of 800 mm/s, Active tension has been introduced to the needle thread tension controller, Excellent quality – The auxiliary clamp holds down the cassette clamp and material, thereby securely holding the material being sewn, It has adopted the guide rail feed mechanism which feedsthe cassette while clamping it with its guide rail, Increased productivity – quilting and run stitching processes for sewing down jackets and winter sportswear can be carried out only with one setup operation, Conventionally regular-interval topstitches have been sewn with a lockstitch machine and the seam quality varies according to the operator’s skill. DDL-8000AP: The vertical shaft is the timing belt, Grease lubricated gearbox, Needle bar colour is silver, The control panel with clock and voice guide, Pulse-motor auto lifter is provided standard, The auto lifter by the low noise and low heat pulse motor is provided as standard, The long arm has the easy material handling.